Mike has worked with Trademark Construction, LLC since 2007 and loves the teamwork. He believes strongly in teamwork, because strong teams build strong companies that last. He has a background as an electrician and professional painter, and has studied construction management. He uses his experience, education, and strong work ethic on every project, with the goal of making every single customer happy. He takes every project seriously, and makes sure that the workplace is neat, clean, and safe. Mike was born in Elizabeth, New Jersey, and raised in Europe, Greece. He returned to the USA at the age of 18 to pursue a career as a professional painter. 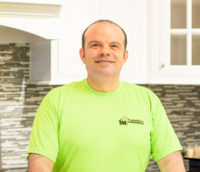 Let him apply his skills and education to your home renovation project – you won’t be disappointed!